You might say Willie Davis has been in the zone lately. The most recent example: two weeks ago, Texas State was threatening to tie their contest early against Utah State, on their first possession ever in Romney Stadium. Senior quarterback Shaun Rutherford had completed five passes—and rushed three more times—to bring the Bobcats within seven yards of pay-dirt. 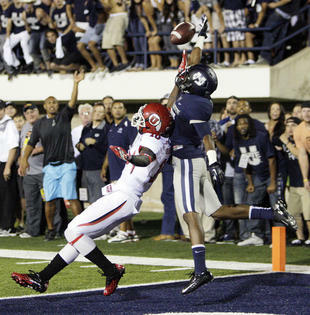 Rutherford’s hopes ended moments later, when a lob to the southwest corner of the end zone fell into the arms of USU cornerback Davis—his third interception in as many games. Rutherford and the Bobcats—or Tyler Arndt, who went just 2-of-8 after replacing Rutherford in the third quarter—would come no closer. In crossing midfield for just three plays after the opening drive, Texas State mustered just 158 total yards of offense—the fewest allowed by USU since the 2008 season. Davis was named the WAC Player of the Week the next day. Given that the Bobcats rank just 77th in the nation in scoring offense—even after a 55-point display last week against Louisiana Tech—perhaps the Aggies’ efforts came at a gratuitous time. But look at the larger picture: USU ranks among the top 20 nationally in five categories, including rushing defense (fifth), sacks and scoring (sixth), total defense (12th) and pass efficiency (20th). In each, the Aggies are first in the WAC. Along with Davis, redshirt freshman linebacker Tyler Fackrell was honored on Oct. 8 and 15—becoming the first USU first-year player on defense to be honored in consecutive weeks. The Aggies will especially need to live up to their credentials this weekend. In 19th-ranked Louisiana Tech (9-1 4-0 WAC), USU (8-2, 4-0) faces the second-best scoring offense in the nation, averaging 53.4 points per game. That number jumps five points higher at Joe Aillet Stadium in Ruston, La., where the Aggies and Bulldogs meet Saturday. Kickoff is at 2 p.m. Led by senior signal-caller Colby Cameron, the quick-strike Bulldogs have scored 20 touchdowns this season in 60 seconds or less. Aranda said that’s a challenge for the Aggies, who like to substitute at a higher rate than average. The task will be even tougher, he added, since LTU coach Sonny Dikes likes to finish plays away from the opponent’s sideline. The Bulldogs have a balanced attack with running back Kenneth Dixon now holding NCAA freshman records for most rushing TDs (24), total TDs (25) and points scored (150). The records were previously held by Marshall Faulk. Then there’s Cameron, who on Saturday against Texas State broke the NCAA record for most consecutive career pass attempts without an interception. His streak is still alive at 419. One of 15 “Players to Watch” for the Walter Camp Football Foundation Player of the Year Award, Cameron this fall averages more than 40 pass attempts per game—more than enough for Davis, who predicted after the Aggies’ Sept. 22 win over Colorado State that “the WAC would be easy,” to salivate. Davis said he was wary of Aranda’s philosophy of emphasizing takeaways when he arrived to Logan last spring from Hawaii. Given the team’s success this season, he’s OK with it now. “I pray to God every game that I’ll get some (passes) thrown my way,” said Davis, who ranks second in the WAC is tied for sixth in the nation in passes defended (1.70 pg). “Sometimes I’ve had only one come to my side—sometimes five. But with the way (Louisiana Tech) plays, it seems like I’ll get 10, 12 coming my way, so I don’t see myself not coming away with at least one pick. NOTES: USU’s 8-2 start to the season is its best since 1974 when that Aggie team also won eight of its first 10 games… USU is 4-0 in conference play for the first time since 2000 when that team won its first four Big West Conference games… USU’s eight wins are its most since the 1974 team posted an 8-3 record… USU has now won at least seven games in back-to-back seasons for the first time since the 1978 and 1979 campaigns, and for just the eighth time in school history… USU’s 13-3 record in its last 16 games under head coach Gary Andersen is its best stretch since going 13-3 during the 1971-73 seasons… USU’s nine straight WAC wins is the most league wins in a row in school history bettering the 1979 and 1980 teams that combined for seven straight Big West Conference wins.